Turn Your ScreenSteps Knowledge Base Into an Employee Training Management System. 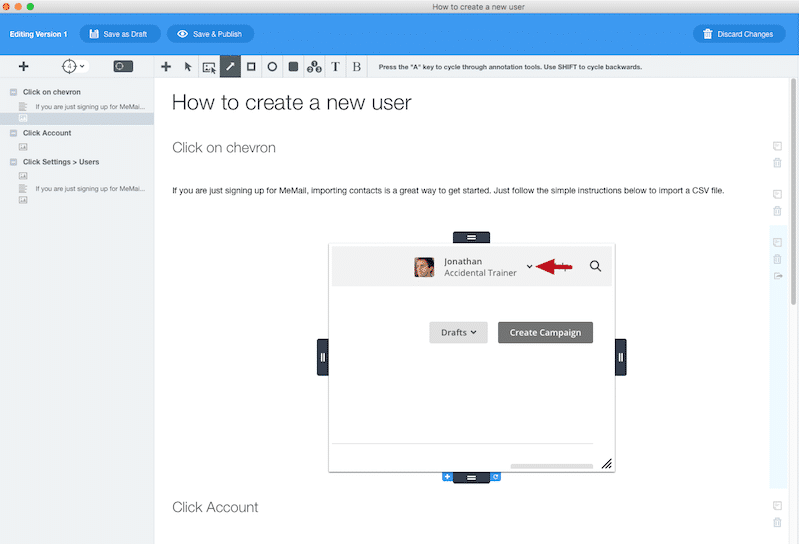 With New Features to Make Onboarding Smoother and Employee Performance Consistent. Create courses that give your employees a consistent training experience. Great for training new hires or employees who are changing roles. Provide contextual tutorials in the cloud applications your business uses. Perfect for supporting employees as they learn new technology and new procedures. Show employees how to successfully use your technology with crystal clear SOPs. Incredibly helpful for periodic procedures as well as repetitive ones. We used the ScreenSteps training methodology and tools, and this round of training went far better than the previous round of training. Our users are actually excited to begin using Salesforce. With the Employee Training Plan, you can organize any of your existing articles into a course with just a few clicks. No more linking to a bunch of articles in an email and "hoping" employees clicked on the links. Now, you can simply create a new course, assign employees to it, and track their progress. You will give your employees and contractors a more consistent training experience. Provide your employees with the help they need wherever they need it. The Employee Training Plan comes with a Chrome extension so your employees can access your training docs, SOPs, policies, and sales materials from any cloud application. Great to use during hands-on training and perfect for when employees need help after training is over. Checklists help airline pilots land planes, doctors perform surgery, and now they can help your employees do their job right too. With checklists, you can create procedure articles that show high-level action items as check boxes, and include the detailed instructions as foldable sections. This format is perfect for new employees who need step-by-steps and for seasoned employees who just need to be reminded about the main actions. Know how much your efforts are impacting the workplace with analytics. 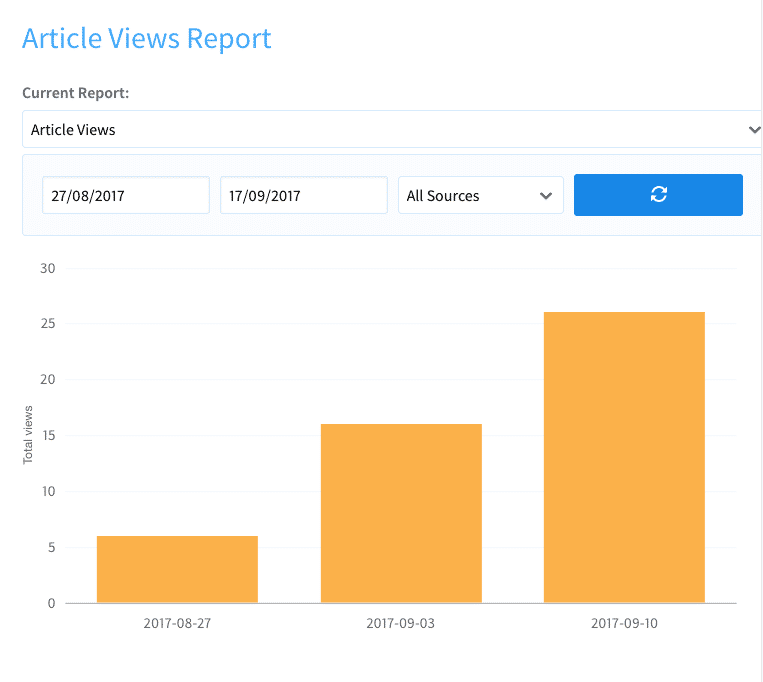 You can see specifics on which articles are being viewed and which employees are viewing them. You can also see who is completing checklists and whether an employee has completed a course. Now you can tie employee performance to their usage of your training resources. Don't worry about managing your employee training docs in separate sites. Now, you can use viewing permissions to manage all of your training material in one site. So, if you want to hide your Admin manual from the marketing team, you can. 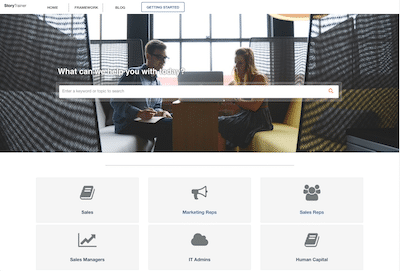 Your ScreenSteps site can now be the company-wide employee training resource. The Employee Training Plan is a paid upgrade to your ScreenSteps knowledge base. You will keep your ScreenSteps account, authoring tool, and your content. Our team will add the training features to your account so you can leverage what you already have and begin training employees. You will continue to use the same knowledge base that you've spent so much time building. 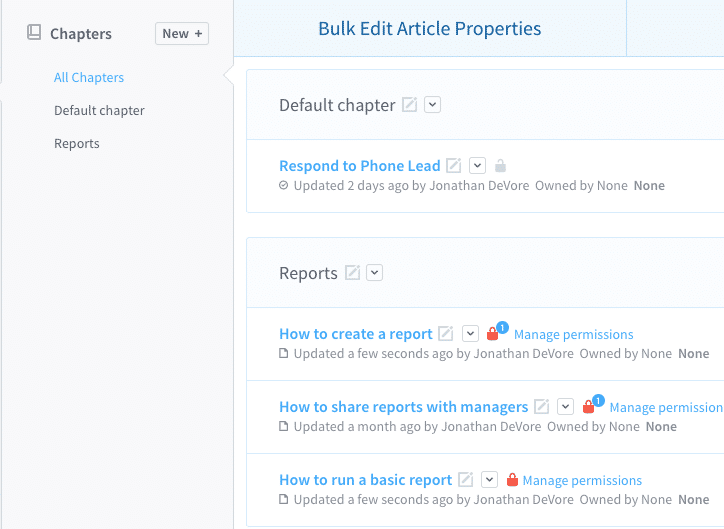 You'll keep the table of contents, search, and PDF functionality. 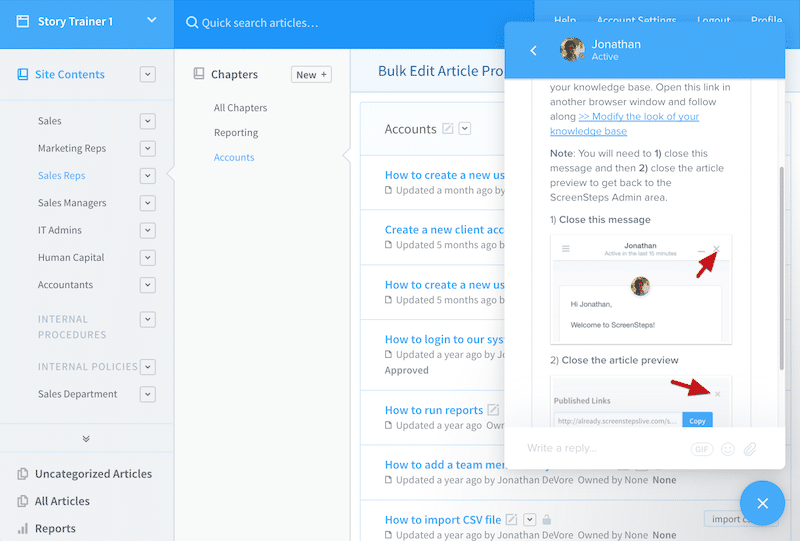 You can continue using the ScreenSteps desktop client and web editor to create regular articles (like you always have) AND checklist articles. Our team will help you every step of the way. From setting up your contextual help, to creating courses and checklists, to preparing a training session.